Genesis Indiana Jones and the Last Crusade (USA) in 06:43.12 by maTO. 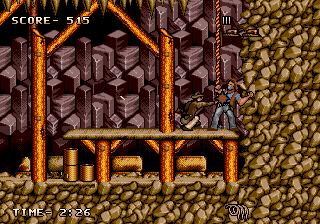 In this action platformer loosely based on the famous film (and not to be confused with The Action Game or The Graphic Adventure), Indiana Jones travels the world to find the Holy Grail with whip in hand. In this run, he grabs the Grail so fast you don't even see it coming — in fact the sequence in which the grail is chosen goes by before the screen finishes being drawn, so you don't even get to see that.